There are many ways to make a bowl of comfort beef stew. This non authentic recipe is one of my favourite and good way to clear up the vegetable drawer in the fridge. 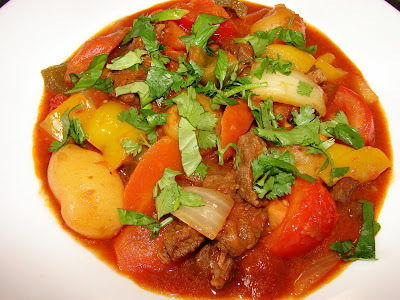 The stew looks ordinary like any tomatoey beef stew but with few oriental ingredients this will taste quite different. Gochujang gives a lovely chilli flavour without being too spicy hot. Star anise is great added to any beef stew to give it a nice aniseedy flavour. Fish sauce to replace salt adds a much savoury flavour. Palm sugar gives a more rounded flavour, if not honey is also very good. Potato better with waxy type, floury potato may fall apart if overcooked which may absorb most/all the juice making the stew looks thick and gooey. This is an economical stew, around 1/2 kg of meat will make a big pot of stew enough for the whole family or half a dozen people. Note: For any vegetables, add harder to cook ones in first. Add soft vegetables like bell pepper, fresh tomato and courgette last. First toss the meat with flour. Heat a pan or wok with some oil till very hot, brown the meat. Do not stir too much or the meat will stew and the coated flour may stick to the pan. When meat is browned or lightly caramelised, remove. Add a touch more oil, add onion and garlic, stir till fragrant. Add the browned meat and carrot. Add enough gojuchang to taste. Add enough water to cover the meat. Bring the liquid to boiling. Simmer for about 1 hour till meat is almost tender. Add potato and other remaining harder vegetables. When tender add mild onion, sweet pepper and fresh tomato or other soft vegetables, continue cooking for for another 2 - 3 minutes. The mild onion and sweet pepper are cooked very briefly to keep them crunchy and sweet, so as the tomato before it started to melt. When done season with a pinch of ground pepper, enough fish sauce and palm sugar/honey. Garnish with chopped coriander/basil before serving. Serve with rice, noodles, pasta or crusty bread or baguette to mop up the sauce. If you have some puffy fried tofu or very firm tofu or frozen honeycombed tofu, this is also good added to the stew. Other meat also works with this stew. Pork shoulder or lamb shoulder chunks the cooking time is slightly shorter than beef. If using Chicken leg meat/small drumsticks, this will cook a lot faster about 25 - 30 minutes add most of the vegetables at the beginning except pepper, tomato or courgette. Oh, I love the idea of adding fish sauce and gochujang! I sometimes put chopped anchovies (the kind that are salted and come in tins with olive oil) in beef stews, which adds a similar fishy note. Wonderful feeling to receive a packet of curing salts...thanks to a thoughtful friend. T Y ...T. Y...T.Y.